The team line-up: Valencia -Alves, Gaya, Cancelo, Mangala, Garay, Enzo, Parejo, Orellana, Nani, Munir, Zaza. Real Madrid - Navas, Carvajal, Marcelo, Ramos, Varane, Casemiro, Kroos, Modric, James, Cristiano, Benzema. Mestalla! 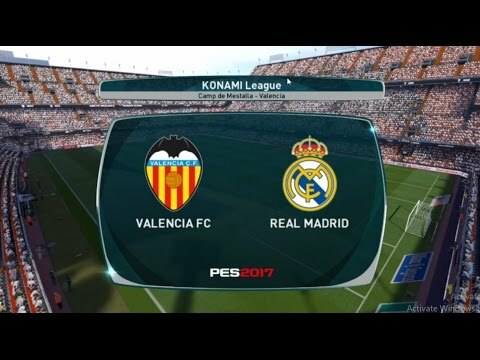 Is on fire as Valencia takes on Real Madrid in La Liga. History: As Zinedine Zidane returned to Mestalla tonight, the stadium where he made his debut for R.Madrid in 2001. 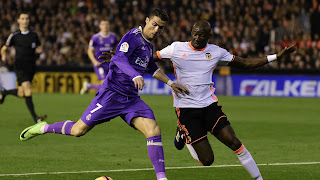 Zinedine Zidane's side failed to make one of their games in hand count as two early goals cost them dearly at the Mestalla, Two goals in the first nine minutes allowed Voro's side to record only their second victory over Madrid in 15 league meetings and bring the leaders' six-game unbeaten run in all competitions to an end. The italian striker Simone Zaza was impressive tonight, As he turn and volley after four minutes of play and the home fans were on their feet, and they were sent to raptures when Fabian Orellana scored his 5th goal of the season. Real Madrid began to regain composure as Ranaldo, Modric, James, Kroos and Benzema continue to force the game on the Voro's side, and Ronaldo find the back of the net with a great headed to end the breathless first half show, Madrid hoping to level-up things in the second 45 minutes. The second half began as Madrid was fully motivated to play high and win the game, But Valencia were up to the tax. Real Madrid really pressing hard and Marcelo was getting plenty of joy down the left and he received the ball from Benzema, firing on goal but Alves held it well. NO PENALTY! Mangala tackled with Ronaldo in the Valencia box but the referee played on. It was clumsy from Mangala. Skillful play from Parejo as he danced down the byline and forced a stop from Navas from a very narrow angle. Better from Valencia. He took the resulting corner deep but it was badly over-hit. Zidane introduced Gareth Bale to boost up his side, Can he score for the second match in a row on his return? Benzema weaved his way towards the Valencia box but sheer weight of numbers saw him crowded out. The ball was swiftly launched back into the penalty area by Carvajal but Mangala headed clear. It been a great performance from Mangala and Garay in defence for the hosts as they stopped most of Madrid counters to win the game,giving Barcelona the hope of winning the League Cup.